This is a much used recipe in our house. We like to make it on a Sunday when we are going out wandering for a few hours, usually for a walk in the woods at Garrykennedy followed by a lengthy session in the playground. As we are usually returning home hungry, we need something to eat that is quick to prepare, but that is also hearty and tasty and worthy of Sunday Dinner status. A version of this recipe we found originally in Hugh Fearnley-Whittingstall’s ‘The River Cottage Meat Book’ where he barbecued butterflied lamb portions from a boned out ½ leg of lamb. 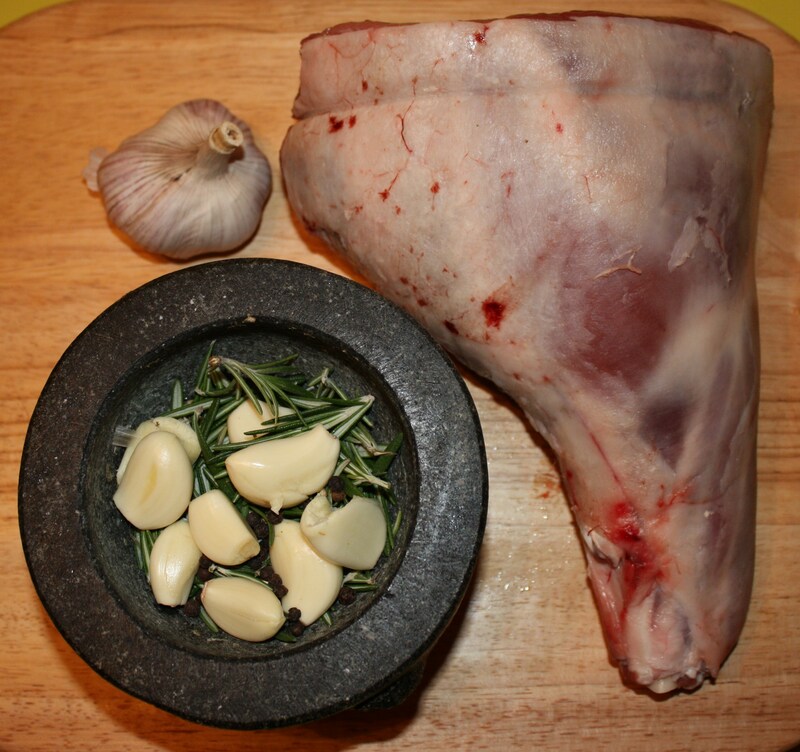 We tend to use either these lamb portions from a boned ½ leg of lamb, which you can find out how to do at the following link, or we use sideloin lamb chops. We use Salsa Verde as accompaniment on a bap, wrap or roll, or to fancy it up, we serve with some roast vegetables including Rosemary and Garlic Roast Potatoes. I love doing the following: Add the roughly chopped garlic and stripped Rosemary needles to a mortar and bash the bejaysus out of them. However, if you don’t have a mortar and pestle to vent in this way, bruise the Rosemary needles by rubbing the sprigs between the palms of your hands. This helps to release that wonderful aroma. Strip the sprigs of their needles into a bowl. Add the garlic to the bowl, along with the olive oil, pepper and meat. Toss all of the ingredients well, and leave to marinade for at least 2 hours. To griddle your meat, ensure your cast-iron griddle pan is smoking hot. 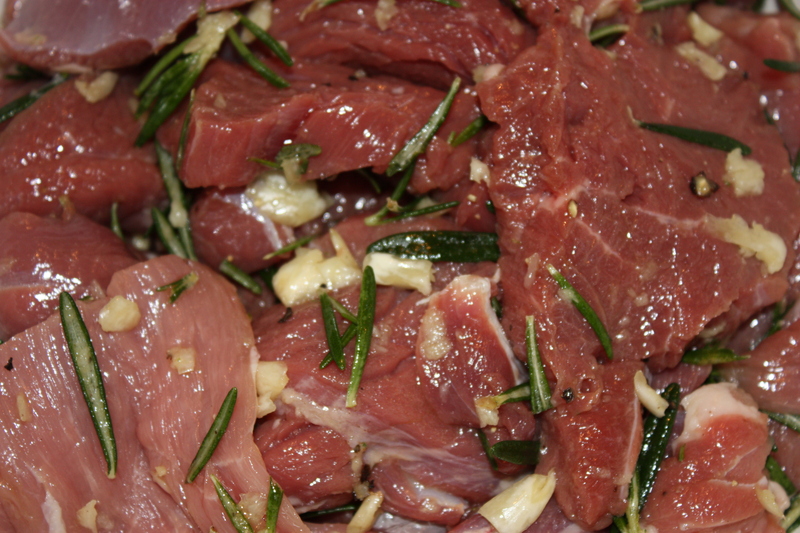 Remove the pieces of meat from the marinade, and wipe lightly prior to placing on the pan. 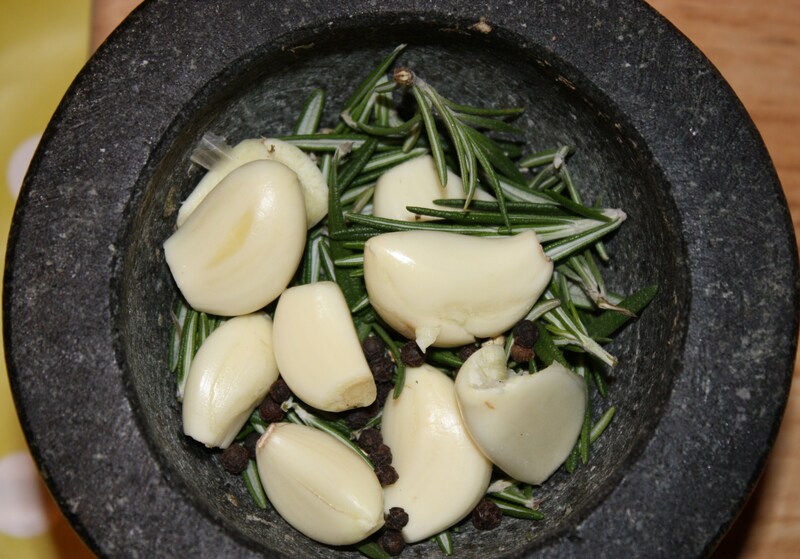 Leave some bits of garlic and rosemary sticking to it, but not too much as they will burn as you go. Cook the meat according to it’s thickness and how pink you like it. To avoid the meat blackening too much on the griddle pan, for those in our family who like more medium-well than pink, we would usually seal those meat portions on the pan before placing it in the oven to finish off. Serve with Salsa Verde, wrapped in some sort of bread, or with Rosemary Roast Potatoes and Roast Root Vegetables. Photographs courtesy of Sarah Ní Shúilleabháin 2012.